Goodreads says, "Lara Jean didn’t expect to really fall for Peter. She and Peter were just pretending. Except suddenly they weren’t. Now Lara Jean is more confused than ever. When another boy from her past returns to her life, Lara Jean’s feelings for him return too. Can a girl be in love with two boys at once? In this charming and heartfelt sequel to the New York Times bestseller To All the Boys I've Loved Before, we see first love through the eyes of the unforgettable Lara Jean. Love is never easy, but maybe that’s part of makes it so amazing." 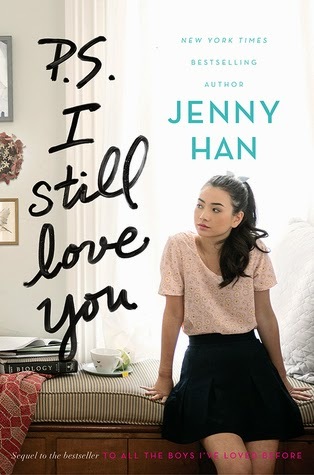 Guys, I know everyone has already posted about the new cover for this book, but I just had to share it as my pick for this week since Jenny Han is one of my favorite authors EVER. I absolutely adored the first book in this series, To All the Boys I've Loved Before (one of my favorite books of 2014!) and I can't wait to get my hands on this sequel. Just in time for weekends at the beach or pool. What do you guys think? I need to read the first one first. I hope you'll enjoy, Christina! I hope you read the first one soon! It's one of my faves. Thanks of visiting, Joy! Great pick! I loved the first book and I hope the sequel will be just as good. The cover is so adorable! Me too. I love the cover. Thanks for dropping by, Christina! Great pick! Haven't read the first book but this seems amazing. I hope you can read the first book, Christine! Well worth it. Thanks for visiting. I highly recommend this series if you like contemporary YA. Thanks for dropping by, Emma. OMG! You need to read Jenny Han! I really like you would enjoy her books. I hope you get to read Gayle Forman as well. Thanks for dropping by, Jenny! These aren't really my taste, but I have a lot of students who do enjoy this genre. It's hugely popular. Han's Summer series is still my absolute favorite, but I enjoy this as well. Thanks for visiting, Lisa. I so need to read Jenny Han. This looks really good! YES! She's my favorite. Thanks for dropping by, Janhvi. I'm very excited for this book! I absolutely loved the first one! Me too. I am glad you agree, Amy. Thanks for visiting. I can't believe I haven't read the first book yet! I even met Jenny Han! I need to get my act together and get reading. Great pick! WHAT!?! You need to read the first book. SO jealous that you met Jenny Han. I have a signed book from her since I couldn't attend a signing when I was a new mom, but I would love to meet her someday. I hope you get to read it soon. Thanks for visiting, Michelle! SO EXCITED! I cannot wait to see what happens next in Lara Jean's life. Especially after the first book's ending! Me too….looking forward to reading it! I'm glad you agree. Thanks for visiting, Lea! I recently read To All The Boys I've Loved Before and I'm very anxious about this sequel. Me too. I'm glad you enjoyed it, Linda! Thanks for dropping by. You met her?!? So jealous. I had the opportunity to, but couldn't make the signing b/c I was a new mom and it was a crazy time with an infant. I am glad you are excited for this book too, Tressa. Thanks for visiting. Me too. I am so glad you agree. I know many sequels can be disappointing, but, like you, I have complete confidence in Jenny Han. Thanks for visiting! This is on a few lists, including mine and my daughter's. Thanks for sharing. I'm glad you agree, Cheryl. Thanks for dropping by! Yay! So many people agree, which makes me happy b/c Jenny Han is my absolute favorite. Thanks for visiting, Bee. Awesome choice! I have heard such great things about the first book in this series though I haven't read it yet. I hope to get to it soon! OH! I hope you get to read it soon. Highly recommended along with her Summer series. Thanks for visiting, Krystianna. I need to read book one in this series soon. Both books look so sweet and Jenny Han is so funny so I can only imagine what her writing is like! You definitely do, Becky! It's a fabulous read and I think you'd like it. Her writing is the best. Seriously. Thanks for visiting!! I'm so excited for this one, too. I loved the first book and can't wait to see what happens next. Great pick! Me too! I am glad you agree. Natalie. Thanks for dropping by.